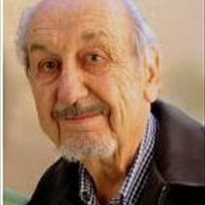 With apologies to Dylan Thomas, Louis Emil Frosh did “go gentle into that good night,” just hours before his 93rd birthday. With grace and dignity, Lou had greeted near-blindness due to macular degeneration. When cancer came calling, he never lost his composure. He kept up with politics and gym classes, continued cooking until recent months, and listened to DVD movies and audio books. And he always welcomed many friends visiting from near his home in Santa Fe and from across the USA. Born in Toledo, Ohio, to Grace Orndorff Frosh and Louis Frosh Sr., Lou had latched onto art as a child. At age 16, his father died, and Lou helped support his mother with retail jobs while still in high school. At the same time, he began evening studies with artist Theodore J. Keane (1880-1952), who had moved to Toledo after retiring as dean of the School of the Art Institute of Chicago. World War II catapulted Lou into the U.S. Army. His Eighth Infantry Division polished its tactics in Northern Ireland and headed to Normandy, where the historic D-Day invasion took place on June 6, 1944. “We landed on the beach on D+29,” Lou said, meaning July 5. “And we made our first command post about 15 miles inland, near La Haye du Puits, France.” Lou received military honors for his service, about which he never boasted. On a visit back to the British Isles, Lou boarded a train and happened upon an aisle seat that would change his life. Across from him sat a beautiful young blond woman, bracketed by a pair of stern parents. He struck up a conversation, and the group discovered they all were headed to Liverpool for a boat to Belfast—near the family’s home in Bangor, Northern Ireland. That was 1951, and after Lou’s many subsequent visits to Bangor, he and Margaret Elizabeth Murphy (known as Betty) married in Chicago on December 19, 1953. From 1959 to 1962, Lou and Betty anchored in her native Northern Ireland to run their own linen-export company, named Abelard. It featured Lou’s original designs on Irish linen place mats and kitchen towels. When their distributor agency was sold, the Froshes resumed life in Chicago. Customs stamps in both of their passports reflected explorations in Ireland, England, Scotland, France, Italy, Spain, and other countries. Each trip inspired Lou to create watercolors, pen-and-ink drawings, and oil paintings. An advertising art director by day, he was a dedicated landscape painter by night—then full time after his 1988 retirement. Like his late wife, Betty, Lou had no sisters or brothers or human children. But he was a steward for many feline companions, including Missy, who will miss him very much as she goes to a new master. And his friends are innumerable. All have been inspired by Lou’s courage, integrity, and kindness. When he died peacefully in his Santa Fe home, where he had lived since 1988, caregiver Dorinda MacAusland was by his side. Over his last several months, she had enabled him to continue enjoying his beloved surroundings. In memoriams are welcomed at Felines & Friends, 369 Montezuma Avenue #320, Santa Fe, NM 87501; www.fandfnm.org; (505) 316-2281. His ashes will be interred at Santa Fe National Cemetery (501 North Guadalupe Street), next to those of his wife, Betty. A service is planned for Thursday, September 18, 2014, at 9:45 a.m., at the cemetery.